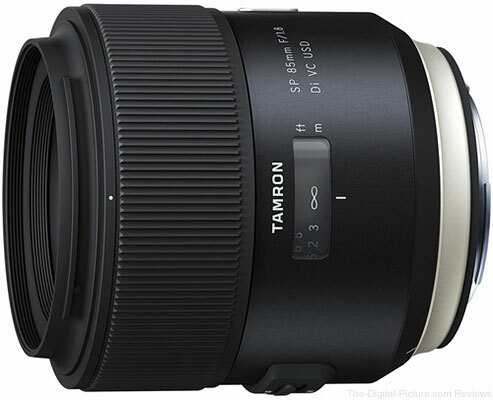 B&H has the Tamron SP 85mm f/1.8 Di VC USD Lens for Canon/Nikon in stock with free expedited shipping. 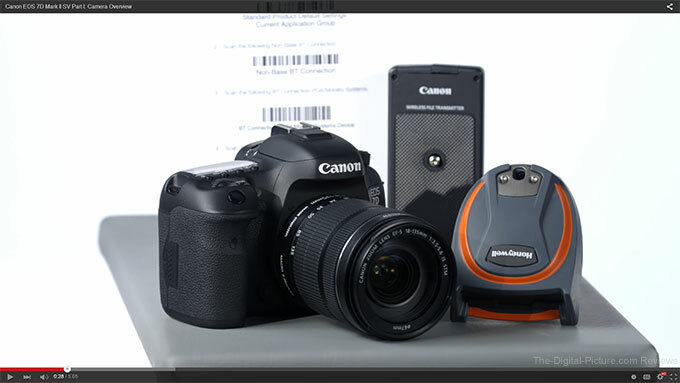 In 2010, Canon announced a special Studio Version of its EOS 7D which allowed for the embedding of barcode details in its images' EXIF information via a specially modified WFT-E5A Wireless File Transmitter. 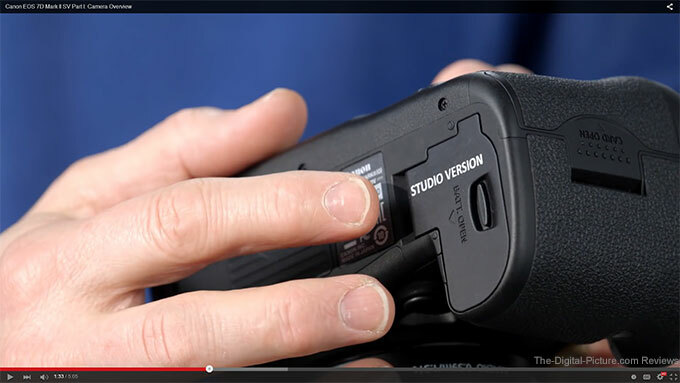 As you can see, the Studio Version of the 7D Mark II can be identified by a label on the battery door. Right now there is no indication whether or not previously-purchased WFT-E7s will have to be modified by a service center in order to enable compatability with the extra features available in the 7D II SV. My guess is that Canon USA will release an official announcement about the specially modified EOS 7D Mark II in the not-so-distant future. Join Canon USA Technical Advisor Mike Gurley as he gives an overview of the EOS 7D Mark II SV Studio Version with a barcode solution. He goes over key camera features and discusses how the camera can be used for different workflows in event photography. Mike also shows how to set up the camera to sync with a compatible barcode scanner. MARCH 29, 2016 –Fotodiox Pro, creator and distributor of several lines of specialty solutions for videography, cinematography and photography, has announced the Wonderpana FreeArc XL - a comprehensive filter system for the Canon 11-24mm lens. Ultra wide-angle lenses, like Canon's extremely wide 11-24mm lens, are usually impossible to filter due to their bulbous front lens element, lack of filter threads and potential for severe vignetting with typical filter solutions. The WonderPana FreeArc XL, however, is the latest in Fotodiox’s custom filter system line and is designed expressly for the Canon 11-24mm lens. Its aircraft aluminum lens collar allows photographers to attach a custom series of massive 186mm filter options, like ND 4-1000 and circular polarizers. The WonderPana filter system has been a worldwide success since its debut, particularly among landscape and architectural photographers and filmmakers. To suit Canon’s ultra wide 11-24mm lens, Fotodiox re-engineered the WonderPana FreeArc to create larger "XL" versions of the mounting system and custom filters to maintain the same level of flexibility and creative control as the acclaimed original. Durable and lightweight enough for hand-held shooting, the WonderPana FreeArc XL can be ready at a moment’s notice to answer any image challenge that require filters. It can even remain installed full-time on a photographer’s lens as a critical layer of lens protection. Additionally, photographers can add the WonderPana WP80 Filter Brackets to the WonderPana FreeArc XL to mount one or two square graduated filters at the same time as a round filter. Measuring 200mm x 260mm, the WonderPana FreeArc XL's square filters are the largest commercially available in the industry today, available as both soft and hard-edged graduated filters at .6 and .9 ND – perfect for meeting any shooting conditions head-on. The WonderPana FreeArc XL is available now for $229.95. The Fotodiox WonderPana FreeArc XL is available on Amazon. As I work through the 80D evaluation, testing this camera's Anti-Flicker Mode was on my to-do list. This technology is such a game-changer for indoor and after-dark outdoor action that I felt compelled to share the test results from the latest EOS model to feature this capability. The top set of images show consecutive frames from an 80D 7 fps burst using a 1/1000 sec shutter speed under fluorescent lights with no flicker avoidance in use. The uneven brightness and white balance shown in these photos represents a daunting post processing challenge. The best solution to the light flicker problem is Canon's Anti-Flicker Mode, available in many of Canon's EOS DSLR cameras, starting with the 7D Mark II. 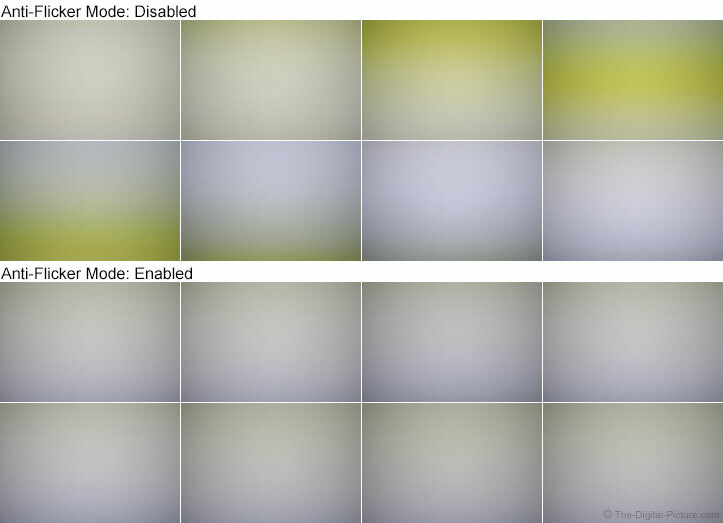 The bottom 8 images show the results of the enabling the Anti-Flicker Mode. My results from shooting an indoor soccer match with the 80D were similarly excellent. 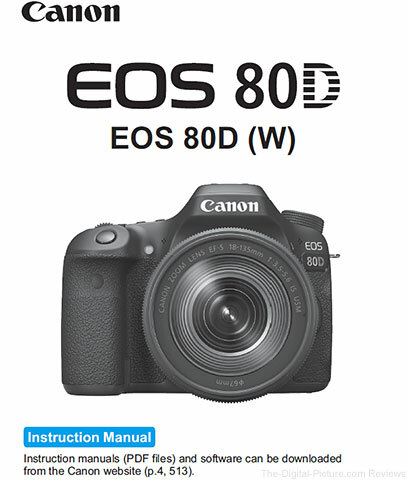 B&H has the Canon EOS 80D in stock. Seemingly well ahead of the US availability of their lens modification device, Tamron has released the corresponding TAP-in Utility Software. *By first updating firmware to the most up-to-date version with use of TAP-in Console, it becomes possible to use all the functions of TAP-in Console compatible with this lens. 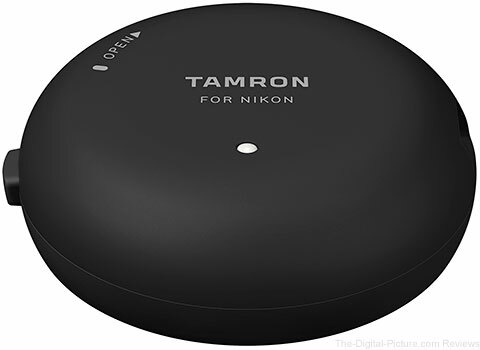 **Initial firmware update by Tamron service facility is required to enable compatibility with the TAP-in Console. B&H will carry the Tamron TAP-in Console when it becomes available. 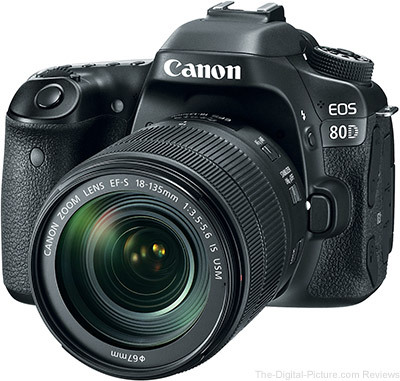 Noise test results have been added to the Canon EOS 80D page. In addition to the standard 80D test results, you will find 7 additional sets of results. The RAW-captured standard results utilize Canon's Digital Photo Professional Standard Picture Style with a sharpness setting of 1 (very low) and no noise reduction. The next two result sets utilize the default Standard Picture Style settings selected in-camera with standard noise reduction also selected, showing RAW vs JPG capture. The MSNR results show the capability of Multi Shot Noise Reduction, also with the default Standard Picture Style and settings selected (JPG capture required). While MSNR shows great improvement (roughly 2 stops), it has limited usefulness in real world shooting. I'll explain more about this in the full review. The next two result sets are labeled "Pushed". These images were created from the same baseline "Standard" results (no noise reduction, very light sharpening), but the brightness was pushed by 1 and 2 stops during post processing, simulating a severe underexposure situation. Similar results were added to the Canon EOS Rebel T6i and Canon EOS 70D tests for comparison purposes. The last pair of results were acquired by underexposing and overexposing the original capture by 2 stops and then adjusting the results in Canon DPP by the same amount. The result is more noise and less noise respectively. The bright colors become muted in the overexposed capture due to blown color channels being darkened; but otherwise, these results show a benefit of ETTR (Exposing to the Right). 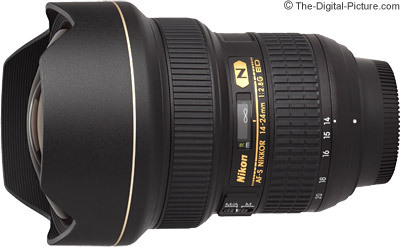 Reminder: The current Nikon Lens Instant Rebates are scheduled to end Apr. 2 (this Saturday). The best time to purchase new gear is during a rebate period, so don't miss this opportunity to save money while investing in new glass. 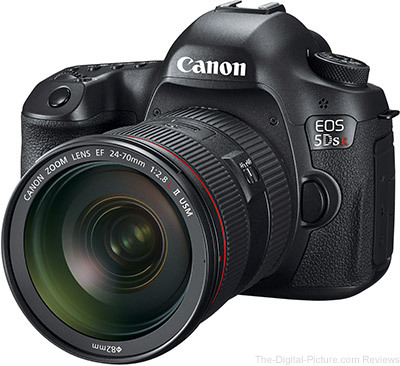 TOKYO, March 29, 2016—Canon Inc. announced today that the Company’s interchangeable-lens digital cameras (digital SLR and compact-system cameras) have maintained the No. 1 share of the global market for 13 consecutive years from 2003 to 2015. Canon, which develops the key components featured in its interchangeable-lens cameras—the CMOS image sensors, image processors and interchangeable lenses—employs these cutting-edge technologies across its entire product lineup, from entry-level models to professional-use flagship cameras. Through its robust product lineup that effectively responds to the needs of a wide range of users, Canon has continuously secured the top global share within the industry. I'm sure you've seen them before, but in short, a photomosaic is a photo that is made up of lots of individual photos. If arranged and edited properly – and viewed from a distance – the individual tiles transform into one beautiful overall image. My first experience with photomosaics came in high school. A favorite history teacher of mine had a photomosaic of Abraham Lincoln adorning his door which utilized pictures of the Civil War as the tiles. It was captivating. After college I came across a very cool free program – AndreaMosaic – that allowed users to create photomosaics simply and easily by adjusting a few variables and letting the computer do all the hard work. I created several photomosaics at the time but I hadn't created one in several years before last week. The good news is that AndreaMosaic is still in development and works better than ever. The desktop application is compatible with Windows XP, Vista, 2000, 2003, Windows 7 / 8 / 8.1 / 10, OS X 10.7 - 10.11, and can even be installed and run from a flash drive (Windows only). And the best news – it's still free. There are a few very advanced features that are unlocked by purchasing the software, but... my guess is that very few people will feel limited by the features included in the free version. The ease and simplicity of creating photomosaics – along with the large batch of images necessary to create a good one – make it a perfect add-on for your wedding photography services. Wedding clients typically love them. 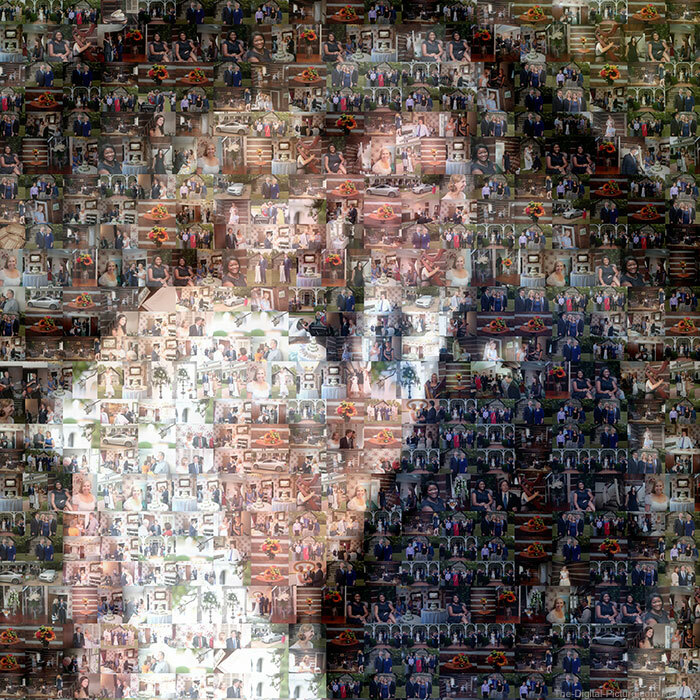 For the example photomosaic seen above, I used a little more than 450 images from a wedding I shot in late 2014 as the individual tiles. The overall image was my favorite shot of the couple, Kim and Brian, on their wedding day. For starters, the more tile images you have to start with, the better off your final photomosaic will look (with fewer duplicates). My suggestion is to create a resized batch of tile images to reduce the algorithmic processing load. I personally used COOLTWEAK to create a set reduced resolution images that were 800 pixels on the longest side (although I could have resized to an even smaller resolution). If using Lightroom or DPP, simply set the Resize option accordingly in the program's export/batch dialogue. The main reason for using reduced resolution tile images is that your photomosaics will be calculated and compiled much more quickly, meaning that you can easily modify the various parameters and create several different versions of your photomosaic in a very short amount of time. And since your tiles will likely end up relatively small (depending on your chosen settings), you won't likely miss the incremental resolution you gave up to gain faster processing time (each tile in the photomosaic seen above is only 120 x 80 pixels at full-resolution). Now use the "+" button at the top of the window to point AndreaMosaic to your main mosaic image. Using a full resolution file is preferable here, as it gives the program the best chance to closely match details using the tile images. Next, click the stacked images below the number "2" to select your tile images. The program will bring up another window. 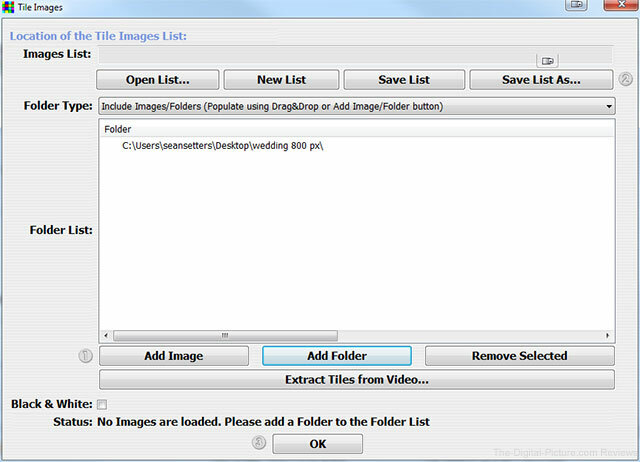 Click the Add Images or Add Folder buttons to specify your tile images. Now click "Save List" to save this collection of tile images. Doing so will expedite the process of creating future photomosaics with the same images. The program will then analyze your tiles and provide some handy information on them. 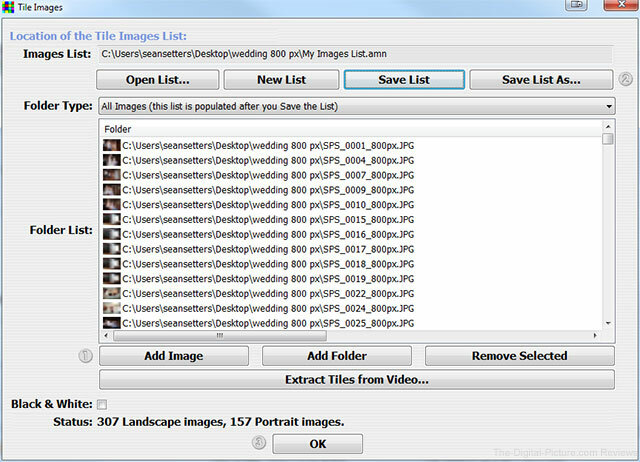 Notice the part at the bottom that says, "307 Landscape images, 157 Portrait images" from my example tile set. It's important to note an approximate ratio of landscape to portrait images as it will help us choose an optimal Pattern algorithm later on. Click the OK button to return to the main parameters window. The Size Parameters will vary widely based on need, but I chose to create a [roughly] 20 MP image at 300 PPI. Because details in my overall image are quite small, I chose a relatively large number of tiles per row (30) because smaller tiles will help define smaller details. If your overall mosaic image has larger (and fewer critical) details, you can easily choose a lower number of tiles per row. However, if your photomosaic features a relatively small number of tiles per row, your individual tiles will have to be large enough in resolution to fill the row accordingly. The Tile Parameters, just like size parameters, will vary significantly from user to user and from job to job. For my image, I set the Pattern option to "Mixed (2.0L 1P)" because I had roughly a 2-to-1 ratio of landscape to portrait images in my tile set, meaning that the program should utilize my tile set more effectively (with less need for duplication) using that option. I also could have chosen "Parquet (2L 1P)" or "Mixed2 (2.0L 1P)" for similarly tile-efficient results but with a different looking pattern. If you resized your tile images as advised, you can easily try several different tile variations in a short amount of time to see which one best suits your overall image and intended use. Note that some of the features, like certain patterns and select 1/2 and 1/4 tile options, are only available to those who donate at least $2.00 to the developers. Let's take a look at the next set of options – Use same tile up to, Duplicate spacing & Color Change. By default, AndreaMosaic will analyze your tiles and attempt to use the place them in the overall image where it calculates they look best. This means some of your image tiles may get used significantly more than others. To minimize duplication, you can limit how many times the program utilizes any one tile with the Use same tile up to option. 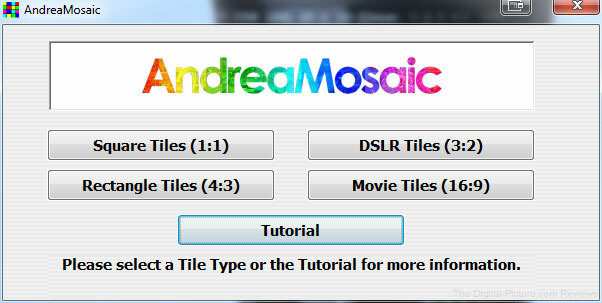 One way AndreaMosaic helps you improve the look of your photomosaic is to allow you to space out duplicate tiles with the Duplicate Spacing option. I chose the "5 tiles minimum" spacing option, but if you're starting with a large number of tiles (with less need for duplication), you might want to set this value even higher for optimal results. The next option, Color Change can have a huge impact on how your final photomosaic will look. If you set this value to a low percentage, your final photomosaic may not be recognizable as far as the overall image is concerned. Setting this value to a higher number will ensure that the overall photomosaic is a good representation of your featured image, with the downside that each individual tile will be automatically adjusted to a higher degree. For my purposes, I chose "65%." The next set of options is the Tile Variants. These parameters are here to help bolster your number of tiles available (reducing duplicates) by allowing rotated, mirrored and flipped images. Note that the "Integral Tiles" option is new (it isn't even shown in the User Manual that's installed with the program) and, from my understanding, is supposed to keep your final row intact (uncropped) by adjusting the overall dimensions of the image slightly to accommodate for any discrepancies in sizing. Unfortunately, my final row was cropped even though I left a checkmark beside the option. You can save your parameters in the Load/Save Settings section for future use and/or specify file type, mosaic filename/save location using the More Options icon located at the top/right of the window. When ready, simply click the Mosaic icon at the top of the window (it has a "3" beside it) to compile your photomosaic. And voilà! Your photomosaic will be created after processing. 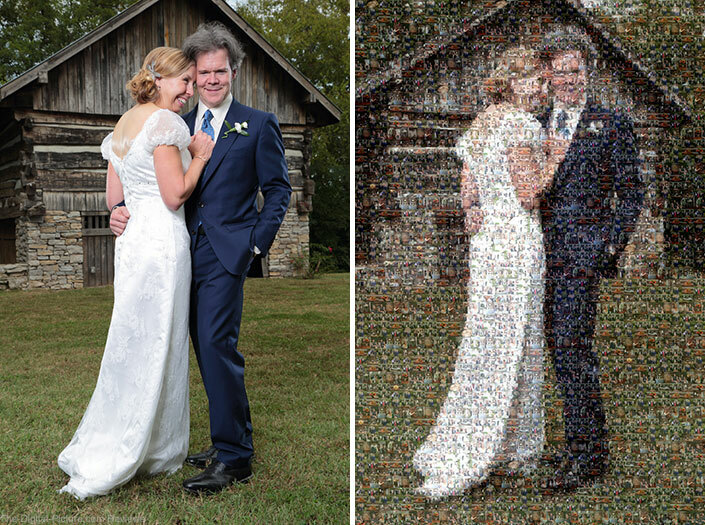 Keep in mind, the photomosaic market isn't limited to wedding couples. Hospitals, large businesses and any medium-to-large sized organization will likely enjoy seeing their logos comprised of hundreds of images of their employees or group members. And creating a photomosaic is an excellent way to generate income through large print sales and billable hours of photography services necessary capturing the tile images. As I noted earlier, a donation of at least $2.00 will unlock a few additional features of the program. If you need even more flexibility in creating photomosaics, you can unlock Professional options with a $35.00 donation. What do you get with the Professional version of the software? Take a look at the following screen shot from their User Manual. 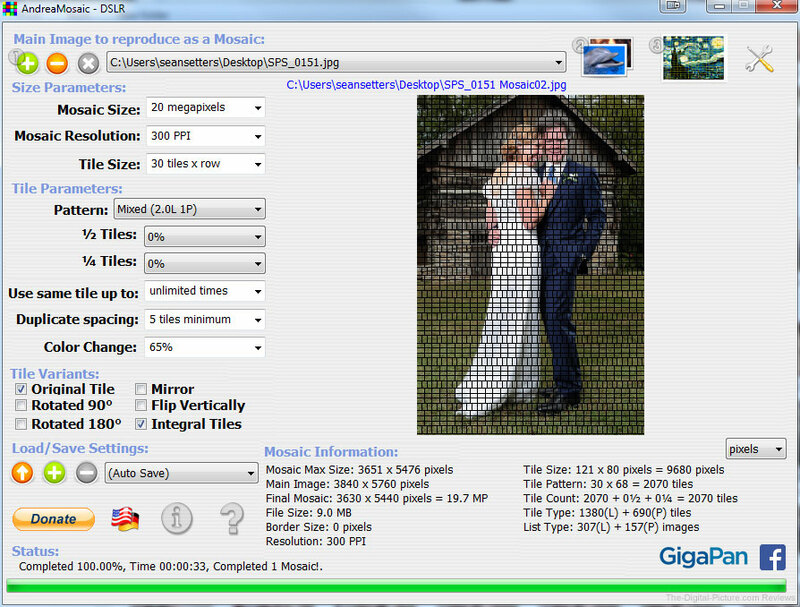 Want to create a 100 Gigapixel photomosaic? The price for the Professional version of the software will be well worth the investment. And even if you don't plan on making photomosaics that ambitious, you might consider throwing a few dollars the developers' way to thank them for providing an excellent profit-generating program. 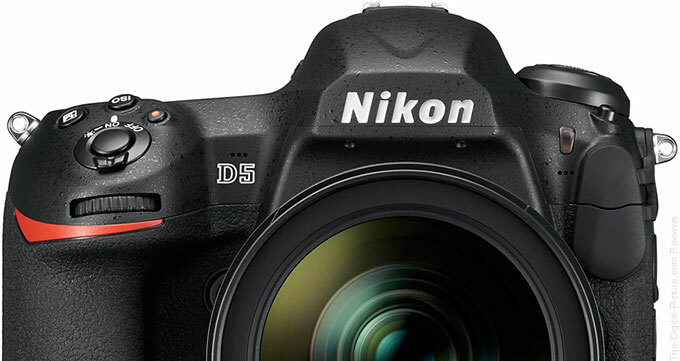 Nikon has published a Technical Solutions Guide with tips for the D5. B&H has the Nikon D5 available for preorder. Can the DJI Phantom 4 Actually Track the Phantom 3? The DJI Phantom 4's Active Track and Obstacle Avoidance features were heavily hyped during the product launch, but the question remains - just how reliable are the new features? Early purchasers are now finding out. We just got the new DJI Phantom 4 here at Lixi Studios, and decided to try the new Active Track feature in the most ironic way: by trying to track the DJI Phantom 3! We also do a review of the new features, show off test footage, compare it with the DJI Phantom 3, and participate in our usual hijinks along the way. B&H has the DJI Phantom 4 available for preoreder. Permalink: Can the DJI Phantom 4 Actually Track the Phantom 3? TOKYO, March 28, 2016—Canon Inc. announced today that the Company will begin accepting entries for its New Cosmos of Photography 2016 (39th edition) photo competition on April 20. The New Cosmos of Photography is Canon’s cultural support project to discover, nurture, and support new photographers who pursue new possibilities in creative photographic expression. Aiming to incorporate diverse perspectives, the number of judges for this year’s competition will be increased to seven toward the realization of an even more open photo exhibition. Entries for New Cosmos of Photography 2016 will be accepted between April 20 and June 15, 2016, while the Excellence Award selection committee is to meet in July to choose seven Excellence Award winners and fourteen Honorable Mention Award winners. Later, in November, the Grand Prize selection committee is scheduled to meet to select one Grand Prize winner from among the seven Excellence Award-winning entries. The Grand Prize winner of this year’s competition will receive not only JPY 1 million in prize money and a Canon product, but as an added bonus will be granted the right to hold a solo exhibit at the exhibition of winning entries for next year’s New Cosmos of Photography. Additionally, to encourage the continued pursuit of their creative activities, 2016 Excellence Award and Honorable Mention Award winners will each receive prize money and the right to display their works at this year’s exhibition of winning entries. According to the Egami Blog, Sigma has patented the optical formula and technology for a 24-70mm f/2.8 DG OS HSM | Art lens. Note: B&H's online checkout is currently unavailable but will be available at 8:30pm ET.